Summary: I don’t want to be the one to reign on the childrens’ parade, but this franchise must stop, along with all the others. The third installment of this animation adventure film series is certainly not one for the cynical adult moviegoer, but I’m sure the executives at Fox International, the film’s distributors, won’t be losing any sleep over that fact, as the film has already taken a cool $200m in its first week and a half of release worldwide. As a discerning, cynical cineaste I would normally steer well clear of the big budget Hollywood fare in screens 1 or 2 at the local multiplex and head straight for screen numbers 12 or 13 to watch the latest Fernando Leon, Jose Padilha or Francois Dupetron movie. But, of course we all have our guilty pleasures, and I have to confess I really rather enjoyed the first Ice Age film. All the familiar faces are on show, Sid the sloth (John Leguizamo), Manny the wooly mammoth (Ray Romano) and his partner Ellie (Queen Latifah), Diego the sabertooth tiger (Denis Leary), and of course Scratte, the squirrel like rodent, still pining after his nut but on this occasion finds he’s up against some tough female competition. 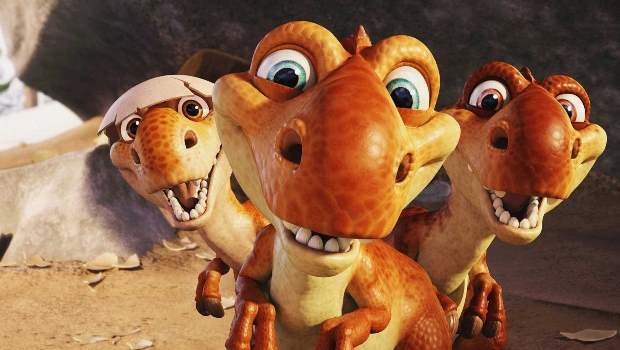 There are also a few new characters thrown along for the ride, including Simon Pegg as a crazy weasel, and a few baby dinosaurs, voiced by the Brazilian co-director Carlos Saldanha. The film begins with Manny and Ellie preparing for the arrival of their baby, leading Diego to think it’s time to venture off on his own and Sid decides to start up a family of his own by stealing some eggs found in a cave. However, once hatched they turn out to be dinosaurs and the angry mother returns to take her babies and Sid with them. This leads Manny and the gang off in pursuit, venturing into a whole new underground world full of dinosaurs and a weasel with an eye-patch, who guides them on their journey. Along the way there are comical moments that raise a smile, often involving the weasel, but the pace of the movie feels rather slow and the characters now quite clichéd. The discerning, put upon central character, the comical sidekick and the eccentric sideshows are common features of all the Studio animation films (see Shrek, Monster’s Inc etc). But this clearly wasn’t the view of the guy sitting next to me with his girlfriend, who laughed uproariously throughout the film even in parts that clearly weren’t meant to be funny. Someone must have slipped laughing gas into his coke, either that or he is someone in desperate need of getting out more. I don’t want to be the one to reign on the childrens’ parade, but this franchise must stop, along with all the others (except maybe Toy Story). The US animation studios have got to take a bold step and create completely new concepts, characters and stories to take animation to a different level, as Pixar did with Toy Story. And I don’t mean just offering them up in 3D either. Monster’s Vs Aliens was one of the worst and most tiresomely clichéd films I’ve seen in a long time. If you want a simple distraction for the kids on a Saturday afternoon then feel free to go and see this movie. If you require something with a little more taste and actual character development then head for screen 12 or wait for James Cameron’s new film Avatar, which has been a long time coming, but apparently worth the wait.